Jar of Fools, subtitled A Picture Story, is the tale of two stage magicians: Ernie Weiss is obsessed with the death of his brother, an escape artist whose last trick went very wrong. Al Flosso, his ageing mentor, is struggling with senility, and losing a little more of himself with each passing day. Then there’s also Esther, Ernie’s ex-girlfriend, an intelligent woman trapped in a dead-end job. And finally we have Nathan Lender, a con-man, who comes to Ernie and Al hoping they can teach his daughter Claire a few magic tricks that will allow her to make a living. When these characters’ lives come together, the result is both poignant and unforgettable. Jar of Fools was a completely random bookstore find. (Note: no book buying ban was broken, as comics are allowed!) I have to say that one of the reasons why I got it was the very enthusiastic introduction by Sherman Alexie. He not only calls it his favourite graphic novel, but he also compares it to, among others, the work of John Cheever and Alice Munro. And he’s spot on. Make no mistake: this is not a happy story. 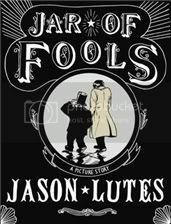 I suspected as much all along, but Jar of Fools was still grittier than I thought it’d be. But the misery and despair are never pointless: they’re honest and perceptive portraits of the many ways in which human lives can and often do go wrong. And despite all the sadness, Jar of Fools manages not to be bleak. What saves it, what saves these characters, are the human ties they establish; the gestures of kindness, the love that unites them. Which isn't to say that Jar of Fools builds up to some trite or overdone conclusion about how love can save you from homelessness and ruin, senility and memory loss, or personal grief. But there are many honest and moving moments in the story in which we see the comfort that connections can bring. We see these characters do the best they can to cope, to feel better, to live through another day. There’s no erasing the past, but there’s learning to live with it, or to let go of it. Jar of Fools ends with one final sacrifice, one final loss, that left me with tears in my eyes. From beginning to end, this is a story full of broken-hearted people, but until and beyond the very end we hope that they will be okay. 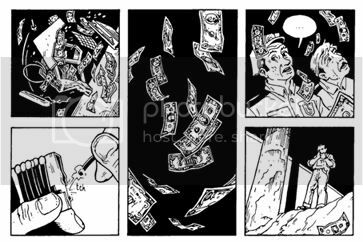 A few words on the art: I love how Jason Lutes captures emotions with just a few lines. His style (and indeed the tone and content) reminded me a little of Will Eisner, and that is high praise indeed. I do that probably once a month. No worries, like Debi I'm glad you posted it by mistake. I love the art...even without words there is so much said. I have never read a graphic novel in my life, but I'm keeping a nice list of good ones, just in case somebody comes up with a challenge! I keep doing that too Nymeth. You only have to put one detail wrong and it publishes it. I am having a feeling of deja vu. 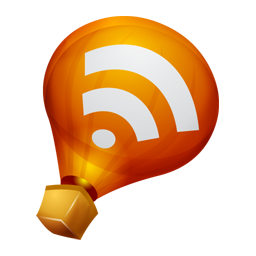 I just read about this over at Debi's blog. It looks fantastic. I need to join a graphic challenge next year,so I can get into read more of them. I have to admit, this one doesn't look like my type of book. The art doesn't seem like I'd like it, and anything that could be described as gritty probably isn't for me. :) Ah well. I have begun to suspect that your bookstores' comic sections are better than mine. We have hardly any standalone graphic novels, and I rarely just pick up something off the shelf to read. Oh this looks good. I don't read many comics as I never know where to start, but this looks like one to add to my list. Jenny: The one and only independent bookstore in my town is right across the street from the museum where I've just started working...a dangerous, dangerous thing :P They're small, but whoever is responsible for the comics section has excellent taste! Bella: If you ever want a list of suggestions, just let me know! This looks like one I'd enjoy. I need to spend more time in the graphic novels section of our bookstore. I'm also curious about where you find such great graphic novel recommendations. I find that even true book lovers have a hard time recommending past Watchmen. The minimalist art of this is beautiful. 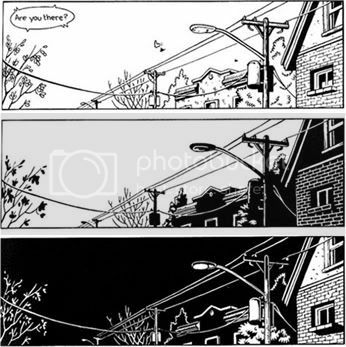 I think part of what makes graphic novels so appealing to me is that the photos do tell a story, without having words present, if done correctly. A new way of reading. That sounds interesting! It's fun to read a graphic novel once in a while. I really enjoyed Persepolis and Maus. Lena: This was really just random browsing...I guess I should thank whoever orders comics for my town's tiny indie bookshop :P And so true about the balance between words and art in graphic novels. That's one of the things Understanding Comics explores (a book I highly recommend). Kelly, I hope it does! Naida: I loved them as well. Simple, but so expressive. Nothing that is compared to John Cheever is going to be happy. I'd been reading a number of his short stories but I couldn't take it any more. I'm suspecting that this isn't quite my style either! I like the art though. I really do like the art in comics!